12 People Are Going To Decide Your Future... Make sure you have someone on your side who can help you. Carl Cornwell has been practicing law for over 30 years, and currently focuses his practice exclusively on criminal defense. He has a wealth of criminal defense experience, having tried over 250 felony jury trials and over 50 homicide cases. Mr. Cornwell was admitted to practice in Kansas in 1977, and has also practiced in Missouri state courts. He has been listed in Super Lawyers magazine since 2005. 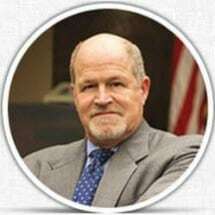 Mr. Cornwell's criminal defense expertise also extends to federal courts, as he has practiced extensively in a number of district courts throughout the United States, from Puerto Rico to Vermont to Washington. He received his Bachelor of Science degree from Kansas State University in 1970. After serving as First Lieutenant in the U.S. Marine Corps for three years, Mr. Cornwell earned his Juris Doctor from Washburn University School of Law in 1976. Attorney Carl Cornwell has his office in Olathe, Kansas. Mr. Cornwell regularly represents individuals from Kansas City and Overland Park and routinely practices in Johnson County and Wyandotte County courts.